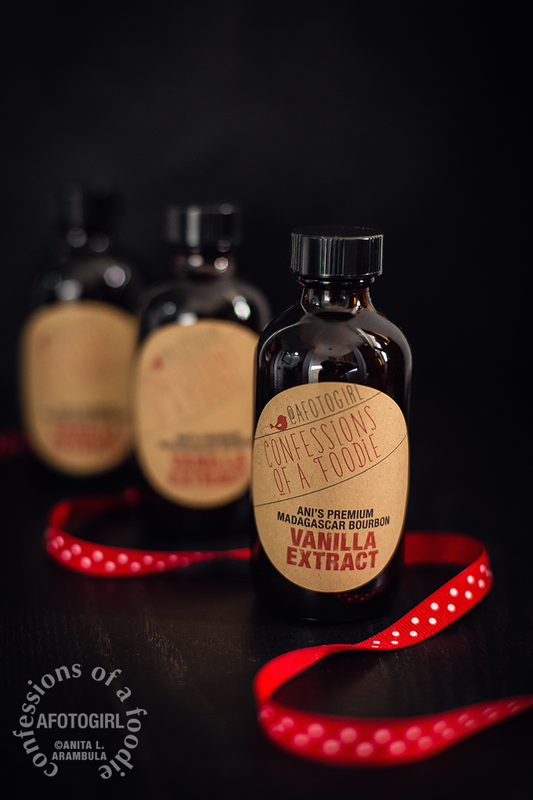 Making your own vanilla extract is super easy and makes for a fun DIY Christmas food gift that keeps on giving. "Christmas? Already? Can't we at least make it to Halloween before we start getting bombarded with holiday hype?" I feel ya. Seriously. I. do. But if you're like me and hate having to shop or scramble last minute come December when everyone else who procrastinated is out bumping elbows, stepping on precious toesies or stealing parking spots to get to the sales, then really, does it shock you that we're talking about Christmas today? Besides which, there is something inherently special about a homemade gift. It takes thought and planning and for me, when I'm making my gifts, I think about the people I'm giving the crafted items to and each step of the process is filled with love towards that person. So yes, we're talking about Christmas today because if you, too, are hoping to do as much of a DIY Christmas as possible, then you best get started NOW. on Thursday that same week. Great selection of bottles and excellent service. They will be my company of choice now. Beanilla has a great selection of vanilla beans at beyond reasonable prices. You can get really small quantities to large orders. Again, I ordered them the same night as the bottles and TWO days later, I had my beans. 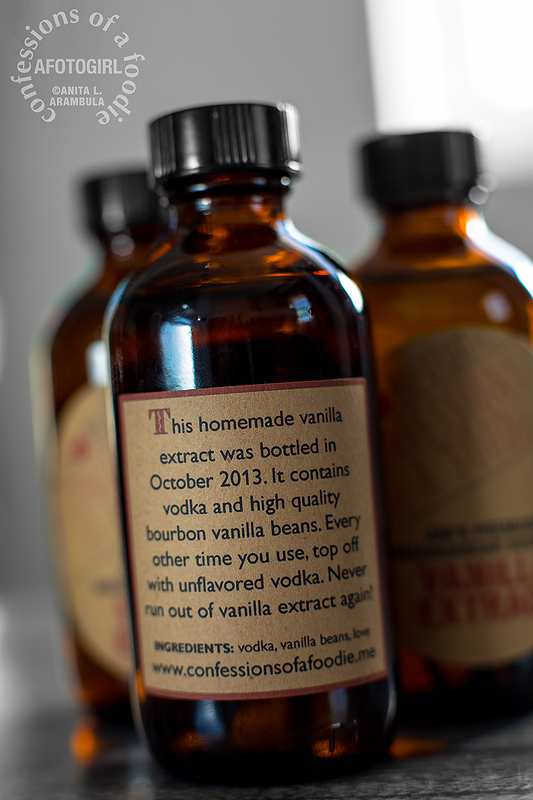 Three-and-a-half years ago, this post on homemade vanilla extract came into my Google reader. Of course, it was the day AFTER Christmas so it wasn't useful to me for presents that year. Since then, Christmas has rolled around and our family has had one stressful event after another to deal with so Christmas was just about getting together with family and being thankful for those of us still around. But this summer, as I was cleaning out bookmarks in my browser, I came across the post again and marked my calendar to order everything I needed no later than mid-October. Homemade extract is ridiculously easy to make. I've read several articles now that claim once you go homemade, you'll never be truly happy with commercial extract again. I can believe it considering that just one week later, opening one of the bottles and taking a whiff of the sweet, slowly darkening elixir fills me with such warmth and anticipation. Plus I love the fact that you're likely to get some actual vanilla bean in each teaspoon you use adding even more flavor (and visual appeal) to your homemade treats. Was happy to find Avery's new (to me anyway!) marketing solutions line. This kraft style was just the ticket. are but that didn't go with the "look" I had in my head for this project. 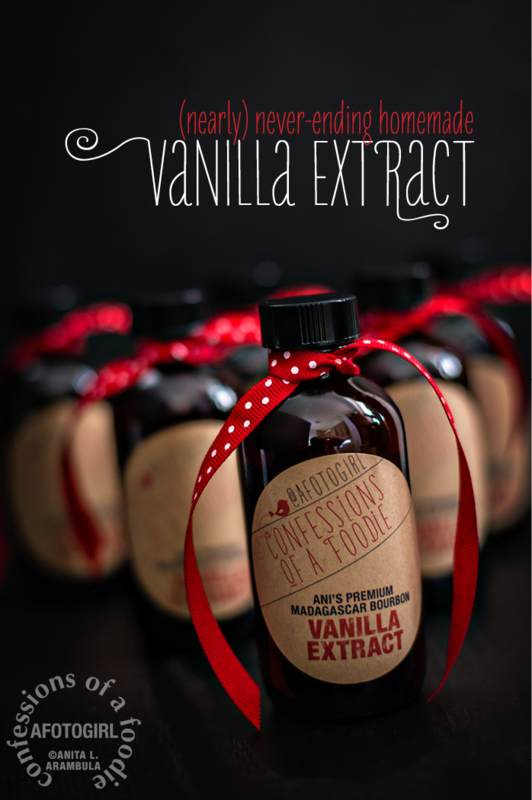 The other cool thing about making your own extract is that you virtually will never run out of vanilla again. Every time you use it, simply re-fill with a little more vodka. 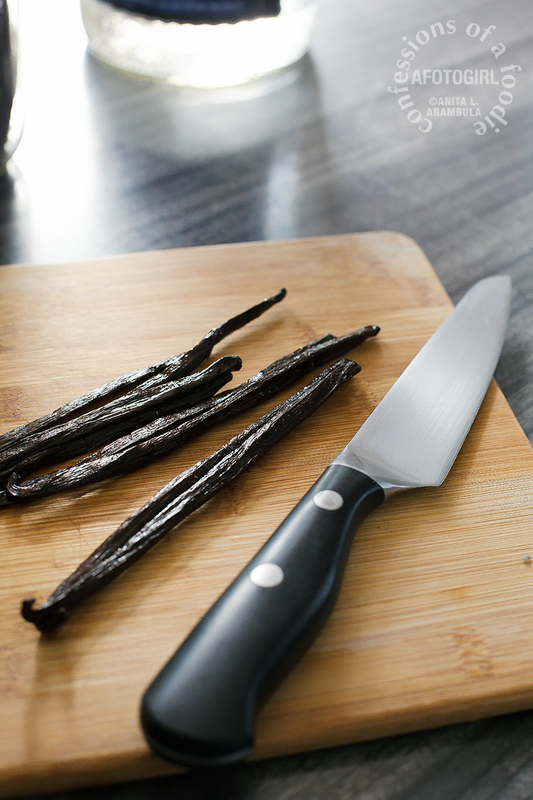 The next time you need to use your vanilla, it'll be ready to go. 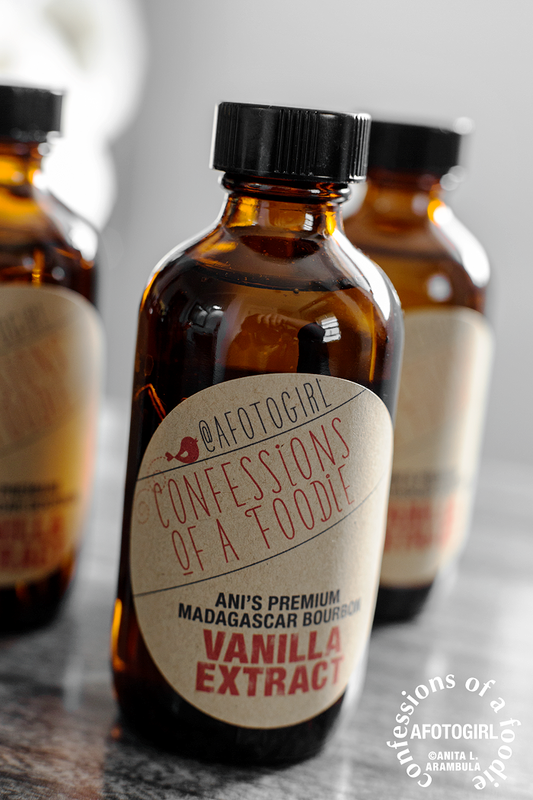 When you find that the flavor is a little less intense, add another fresh vanilla bean to your bottle. 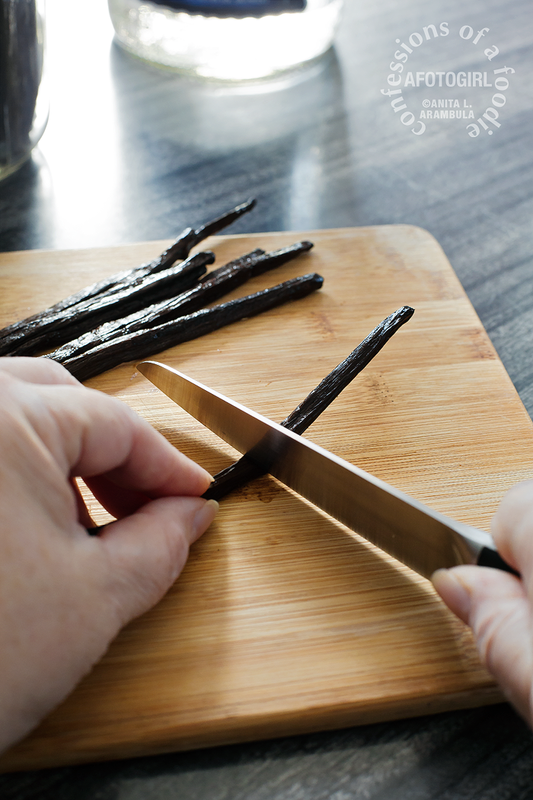 Also, if you buy a vanilla bean for a baking project, instead of tossing the pod out, cut it in half and slip it into the bottle to freshen up the extract. I ordered my beans from Beanilla. What a lovely site! So many choices but since this was my first foray into extract making, I opted for the classic Madagascar Bourbon Vanilla Beans. I also chose to purchase the Grade A beans and not the Grade B. Yes, they are more expensive but I wasn't sure how much extract I ultimately would be making and if I had leftover beans, I wanted to be able to use the caviar for regular baking. The Grade B beans are only for extract making due to their tendency to be smaller and less plumb than their Grade A counterpart. I worked with a dozen bottles at a time, submerging them in hot sudsy water. I had this styrofoam left over from a craft project two years ago. I also had leftover lollipop sticks from that same project so I crafted my own "drying rack." I used as hot water as I could stand to rinse the bottles so they completely air-dried by the time I finished submerging and washing the next set of bottles. According to Beanilla, a half pound bag ($36.99) gives you 40-70 beans (UPDATE: As of April, 2016, the price for the half pound bag has gone up to $69.75.). I knew I'd be making these not only for my friends and colleagues but also for my Auntie's who was going to be sharing the costs with me. That meant 30 bottles for me and 30 bottles for Auntie. At 2 beans per bottle, I opted to go with a one pound bag that Beanilla says contains roughly 70-100 beans. However, my pound bag yielded me 147 beans at the excellent price of just $52.99! 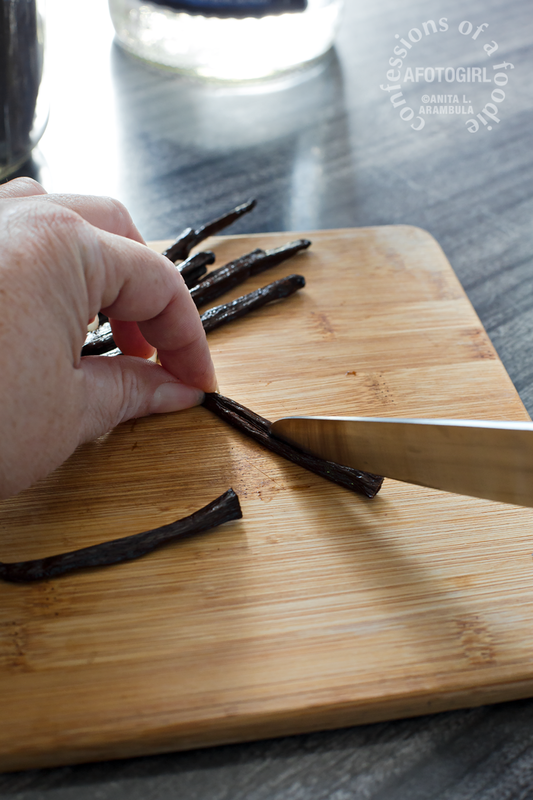 Have you ever bought whole vanilla beans from the local grocery store? I did last Christmas for a baking project. I paid $9.99 for a bottle that contained TWO beans. Two! I have 27 beans left over for baking and other projects. Leftover beans, according to Beanilla, stored in an airtight GLASS container will keep for up to a year. Perfect! Next up, glass bottles. When I only have a few bottles to buy, I inevitably wind up at The Container store. But their 4 ounce bottles are $3.50 each, clear and they come with cork stoppers. 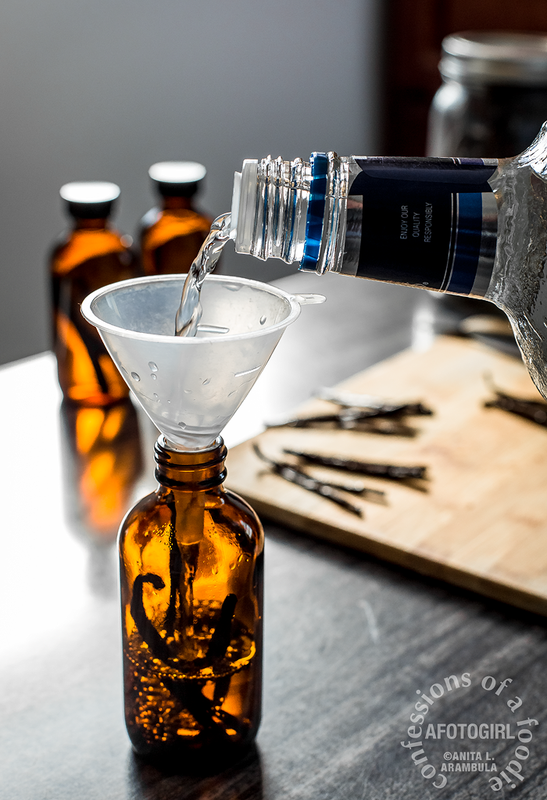 Vanilla extract is vanilla bean and alcohol. Those cork stoppers aren't airtight and before you know it, your extract will be evaporated. So those were out. I did some online comparison shopping and the company that kept coming up was Specialty Bottle Company. I decided to go with brown glass to help protect my precious homemade extract from light. 60 bottles with black screw tops shipped in a huge peanut filled box arrived a mere 4 days after ordering (I ordered at nearly midnight on a Sunday!). The bottles are .78 cents each but taking into account taxes and shipping and handling, they still came out to only $1.10 per bottle. As for alcohol, traditionally, a non-flavored alcohol is used, such as vodka (bottom shelf vodka is just fine) because it will yield a more pristine vanilla flavor. You can also use a good quality bourbon (like Maker's Mark) or even rum. I went with vodka (I used Seagrams Extra Smooth) as I didn't want anything getting in the way of the pure vanilla bean flavor. The weekend I was putting these bottles together, BevMo was having a sale so I got a few dollars off on my vodka. Score. The final piece of the puzzle was the label. I originally looked into having my labels made online but it was ridiculously expensive for one-time use. Plus, you're very limited to the shape of the label and logo size (if any!) not to mention the amount of type. So I headed to Office Depot to see what Avery labels were available. 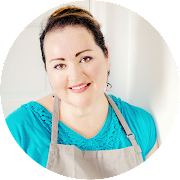 They're line of marketing solutions aimed at small and home-based businesses were the perfect choice for me. 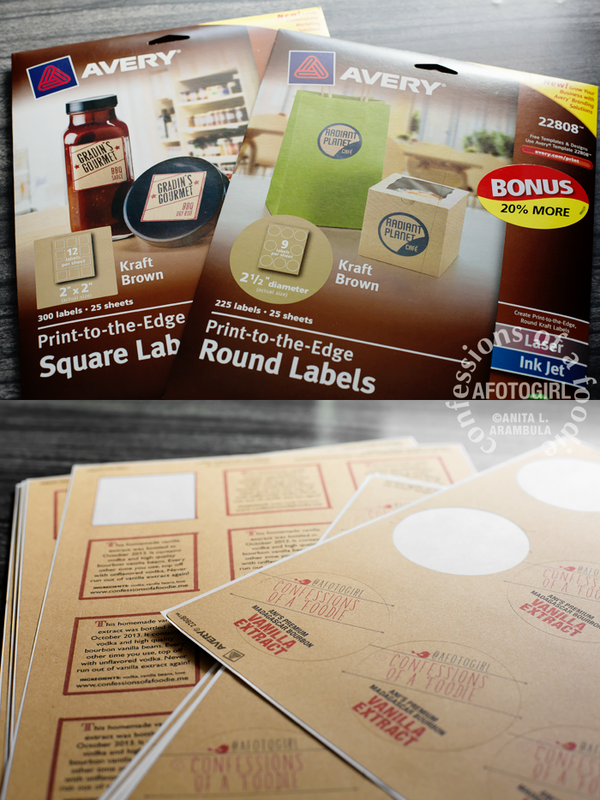 I found some awesome kraft paper labels that fit with my DIY approach. I'm all about presentation, after all. I figure I have enough labels to use on similarly themed projects so that my "brand" remains consistent. I bought a round label for the front of my bottle and a square one for the back so that I could explain to my giftees what they were receiving. Unlike past experiences trying to use their mailing labels on anything other than envelopes, these suckers aren't going anywhere. No lifting here. I misaligned one and I had to soak the dang bottle in water for ten minutes then used rubbing alcohol to remove the stubborn adhesive. 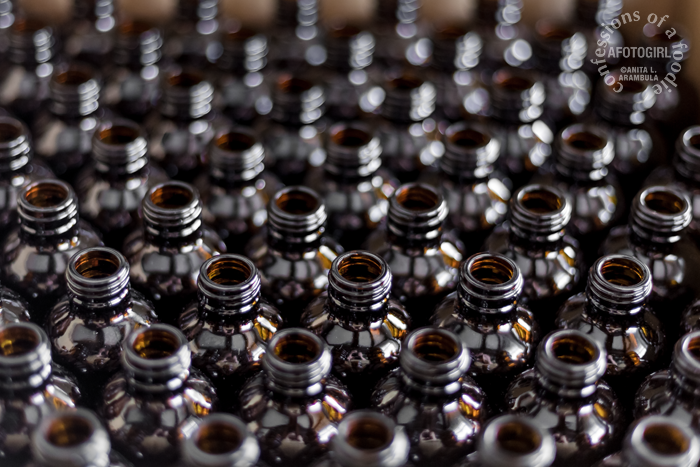 I will admit that preparing 60 bottles took most of the afternoon (granted I stopped to photograph here and there) and after about 30 bottles – that's 60 vanilla beans – I had what I could only describe as a vanilla bean headache. In fact, the smell of vanilla so filled my nasal cavity that I smelled vanilla until late the next day. But you know what? I totally think this project was worth it. They came out so adorable and I can hardly wait to bake with some myself. Once assembled, these babies need to steep for at least 8 weeks before they're ready to use. So you have plenty of time to order your own beans and bottles, design your labels and get these started for Christmas this year. So get to it! When I started the project, I was using a sharp knife to split the beans (see photos). However, after the third one I realized that too much of the precious vanilla caviar was staying behind on the cutting board or getting stuck on the knife. I switched to using a sharp pair of scissors and that solved my problem. 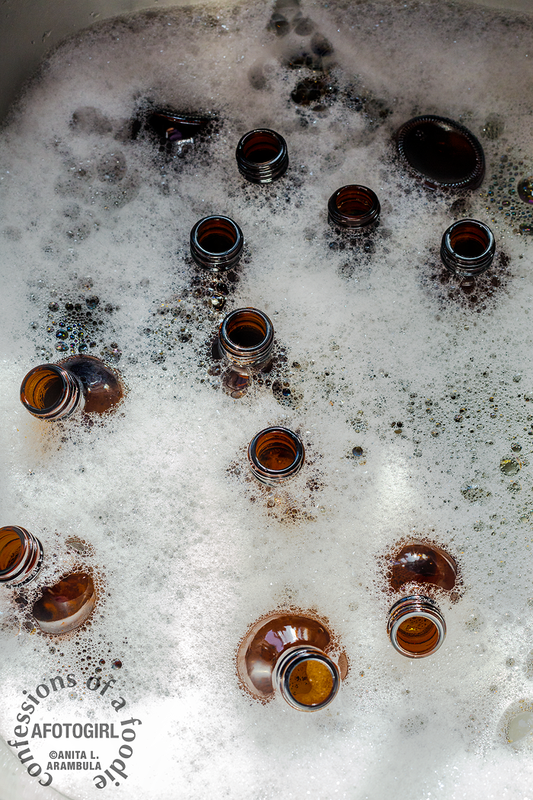 Prepare your bottles by thoroughly washing and drying them first. 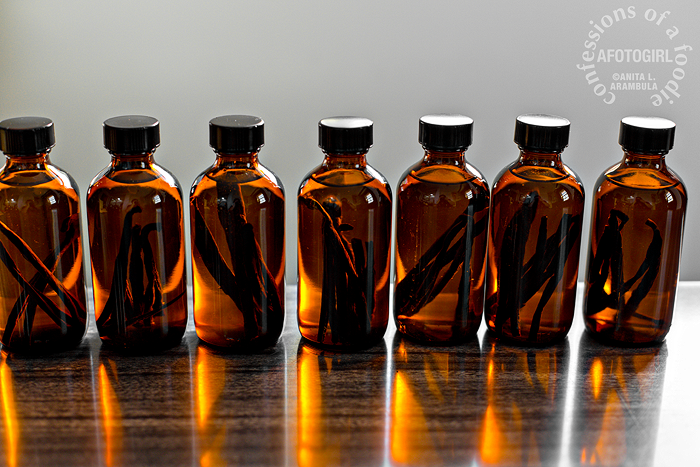 A good rule of thumb is one vanilla bean for every ⅓ cup of vodka so for a 4 ounce bottle, you'll want two whole vanilla beans. Using scissors, cut your beans in half so they fit in the bottle better. Then, cut through the bean halves lengthwise stopping a quarter inch from the end so that one end is still in tact. Add the beans to the bottle. Fill the bottles with vodka stopping just at the start of the neck. You want enough room left to be able to shake the bottle during the steeping process. Screw the cap on tightly. Design and print your labels. 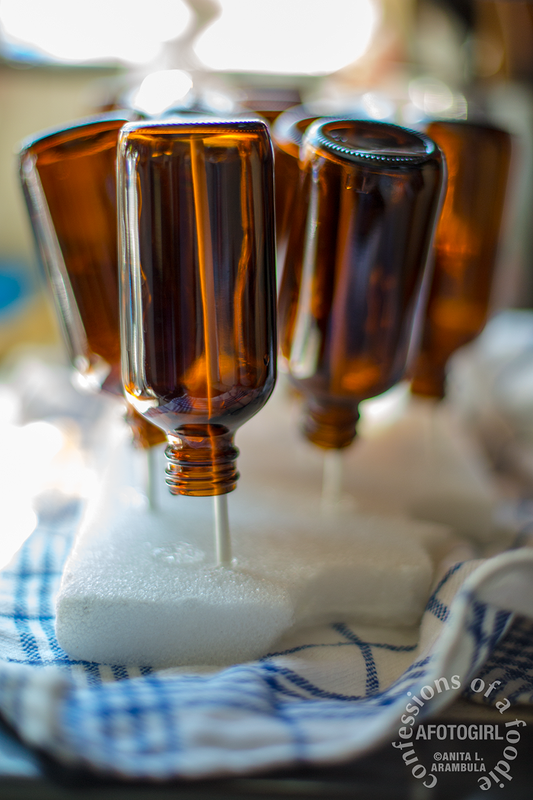 Add labels to bottles and then store the bottles in a cool, dark place for at least 8 weeks. Once a week, give the bottles a little shake to help the process along a little. As you use the vanilla, simply refill with more vodka. After a year or so of frequent use, you might find that the flavor is a little less intense. Simply remove the beans, add another vanilla bean prepared as above and you're good to go again. Be sure to always keep the vanilla bean(s) submerged in vodka. I'm planning on posting a few more "Christmas DIYs" before Christmas gets here. Some foodie related and some crafty related. Hope you'll find them fun and useful! Until next time, my friends! Happy Halloween!!! I'm itching to do this. They're the cutest and most useful gifts! Hi Colette! The first time I saw someone write about this, I was too. And I'm so glad I finally did it. Hope you do try it. Plenty of time left for this year's gifts. :) Take care! Thanks so much for the tips on where to get quality vanilla beans. I have been struggling to find a reputable company, and seeing far too many horror stories involving moldy beans. Your pictures are just to die for too, you are so inspiring! And thank you for the compliment on my photography! This is such an amazing idea! I love homemade Christmas presents. I will have to try this. Now I have used Avery's labels in the past for addresses but never like this. What do you use to design your labels? @Anonymous -- I designed my own labels featuring my blog logo using InDesign. Awesome post! You've made this so easy and I am excited to make some. I think I will give a little vanilla LOVE for Valentine's Day. I'll just need to tell my giftees to store it for the extra two weeks of its steeping phase. 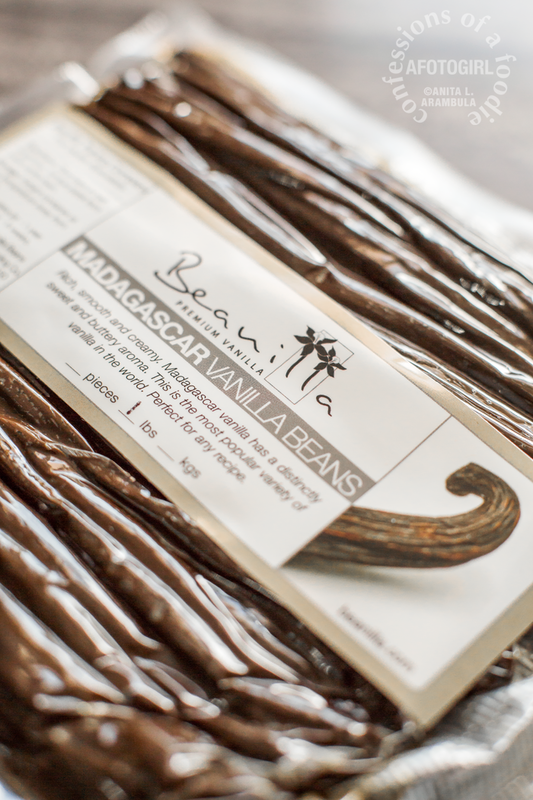 Just an FYI thay the cost of these vanilla beans has DOUBLED on the Beanilla website. Wow. Three years makes a huge difference. Thanks for letting me know!